DNA analysis from Darwin’s specimen gives important information for restoring population of Floreana Mockingbird on Floreana. In news releases yesterday (in for example BBC and Telegraph) it was announced that DNA had been extracted from specimens of Floreana Mockingbird that was brought back to England by Darwin himself. This DNA was compared to DNA from the existent subpopulations on the small islets Gardner and Champion off Floreana. 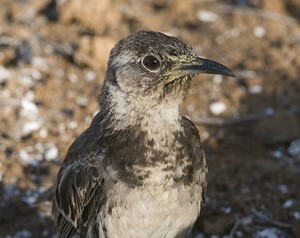 The Floreana Mockingbird became extinct on the main island Floreana soon after Darwin’s arrival due to the introduction of livestock, rats, cats and dogs which soon became feral and now this rare mockingbird only persists on these small islets with a total stable population of around 100 birds in 2007. Floreana Mockinbird is listed as critically threatened by Birdlife International. With such small population, it is clear that it could soon become extinct if there would be any natural disaster of any sort. The main strategy for the survival of the species must include a plan of restoring the population on the main island. The DNA tests confirmed that, in spite of in-breeding on the small islands, the genetic material is basically still the same and that an introduction with mixed stock from both islands at least would be genetically fit to once again occupy the main island. The main problem is not the DNA, but getting rid of the introduced animals. In an article from Galapagos Conservancy the Floreana Mockingbird Restoration Plan is discussed. An eradication campaign of feral animals and restoring Opuntia cactus habitat has already been started. More background information from the researchers. I also found an article by researcher Paquita Hoeck about the current population in 2009, which now estimated to around 500 birds, due to two very good years for reproduction. This is great news for a forthcoming restoration on the main island. How to see Floreana Mockingbird? It used not to be too difficult. Any boat passing by Floreana could just go close to Champion island and the birds could be seen from deck without actually not landing. Now, researching for a birder’s trip to Galapagos, I found out only small boats that are allowed snorkling or scuba-diving around Champion and Devil’s crown off Floreana have permission to be in the area. There is obviously still landing restriction on the island, but the species should not be difficult to see if you are on the right type of boat. Hi Gunnar, Thanks for picking up our story! I agree: some of the news coverage leaves the reader room to conclude that we’re going to pull off some kind of Jurassic Park genetic abracadabra with these birds. You’re absolutely right that ‘the main problem is not the DNA, but getting rid of the introduced animals.’ That’s why the recent successful eradication of pigs, goats and cats is great news! (They’re working on the rats…). An interesting point to highlight is that of the alleles (unique versions of the same genetic region) found in the historic specimens, there are four possible fates: 1) preserved on both Champion and Gardner-by-Floreana, 2) preserved on Champion but not Gardner-by-Floreana, 3) preserved on Gardner-by-Floreana but not Champion, 4) lost. Because the Champion population is so small in comparison to Gardner-by-Floreana, one might have expected that ’2′ above would be very unlikely – in other words that all the diversity of the original population remaining on Champion would also be represented on Gardner-by-Floreana. We found, though, that there was one allele from the historic specimens now survives only on Champion. This is what makes us recommend that birds from both islets should be used in a reintroduction. .-= Karen James´s last blog ..Shiny things =-. Thanks so much for commenting on my blog Karen. Interesting stuff indeed. Does this mean that if would be favorable to start introducing offspring of pairs of Gardner/Champion from a controlled situation? Great to hear that the eradocation of introduced animals is being successful! Previous post: The Jamaican Petrel, is it extinct or alive? Next post: Pishtacos – Human oil extractors – The Bogeymen of Peru.